Dr. Harry Mallios' relationship goes back over forty years. He played football for the Hurricanes from 1949 to 1953, starring on two powerful UM bowl teams. Dr. Mallios, a Marine Corp veteran of WWII, was know as the "Scooter" and became one of the great running backs in Hurricane history. Mallios was the starting fullback on UM's first undefeated team, 9-0-1, which went to the 1950 Orange Bowl and the Gator Bowl team of 1951. In the Orange Bowl game he scored one touchdown and had another touchdown called back, which would have won the game. In the Gator Bowl he scored both UM touchdowns for a 14-0 win over Clemson. 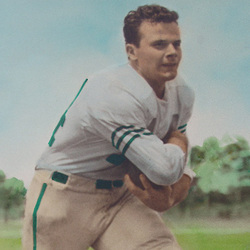 Mallios was named MVP of the Gator Bowl and was also named MVP for the 1952 Hurricane team. At that time he was listed as the 6th ranked all-time scorer for the 'Canes. Dr. Mallios received his Ph.D from the University of Miami in 1970, was a tenured member of the UM faculty, served as an Assistant and Associate Athletic Director, and was the Athletic Director for the Hurricanes from 1979 to 1983. He was appointed Faculty Athletic Representative to the NCAA in 1983 until his retirement. In October, 2010. he was honored as a Miami Sports Founder by the Greater Miami Chamber of Commerce.